Blowfish For Hangovers is a really great “go-to” when you are hungover. It consists of just two ingredients: caffeine and aspirin. Those ingredients work together to provide energy and fight those nasty hangover headaches. I wasn’t expecting much when I first tried this cure, but to my surprise it really worked. My headache went away and I felt energized for my day just minutes after using this product. They’re so easy to use because when you wake up with a hangover, you simply put the tablets in water and drink away. They are inexpensive, taste fine, and get the job done! Thumbs-up on this one! 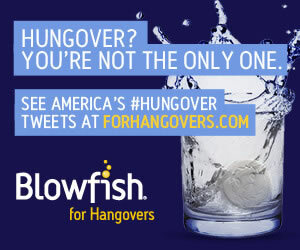 Blowfish For Hangovers is SO EASY to use! I often forget to take my hangover remedies once I start drinking. Luckily with Blowfish you take it the morning after drinking. That makes it an easy go to when I forget to drink enough water or use a preventive hangover stopper. You simply drop the two tablets in water and drink away. Blowfish actually tastes pretty good! I was worried when I first used it because I thought it would be gross, but I was wrong. It tastes pretty good and the fizziness of the tablets in the water feels good on my stomach as I drink it. The next morning I woke up feeling pretty crappy. I went straight towards the hangover cure, dropped my tablets in cold water and gulped it down. After about 15 minutes, I didn’t notice my hangover at all. My energy was back up and my headache was completely gone. I was very surprised with the results! This product contains Caffeine and Aspirin. Basically, just the “must haves” when recovering from a hangover. The caffeine provides energy, while the Aspirin takes away the headache. Since the tablets dissolve in the water you drink, the caffeine and aspirin are gentle on your stomach and start working right away. 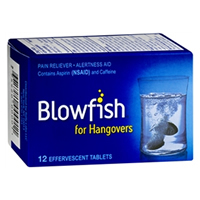 Blowfish For Hangovers costs $11.99 for 12 tablets on their website. That works out to $2.00 per serving. In my opinion, that’s a SUPER great price for helping with your hangover. You can buy Blowfish almost anywhere. You can get it at most drugstores, online, and on Amazon. Unfortunately, I couldn’t find a money back guarantee on their official website, but the return policies and refund terms all depend on where you purchase the tablets.